The Macedonian edition of Seven Houses in France has just been published. This is the thirteenth version (in eleven languages) of the renowned novel by Bernardo Atxaga. 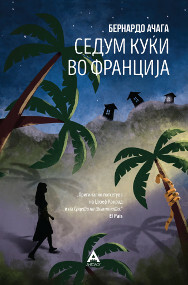 Skopje-based publisher Antolog Books has published Sedum kukji vo Francija, the Macedonian translation of Seven Houses in France. The novel has been published in eleven languages, including French, English, Italian, Danish, Albanian and Portuguese.